When something abuts something else, it is next to it or forms a border with it. Demarcation is the process of setting boundaries or limits; a demarcation is a line that provides a distinct separation between two things. When something encompasses something else, it includes all aspects of it, or completely surrounds it. Let’s put all the bookshelves on the periphery or edges of the room and the couches in the center. That way, we can walk along the periphery or boundary of the room to browse for something to read. That way people standing at the periphery or surrounding outer space discussing what they are looking for will not disturb those who are reading quietly in the center. Quiz: Try again! 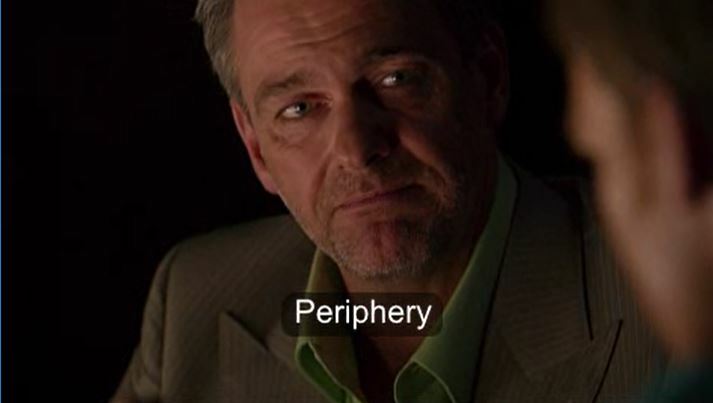 What is a periphery? It is the focus of a place. It is a border between one country and another. It is the outlying area or boundary of a place. Computer Peripherals Peripherals are the things that sit in the periphery of your computer. A periphery of a building is the “state or condition of carrying around” that building. One’s peripheral vision describes the outer reaches of one’s eyesight, that is, what we see around the edges of our sight that is not our central gaze. Dexter They exist on the periphery.